The Executioner is another newly commissioned ship of the Amarr Imperial Navy. 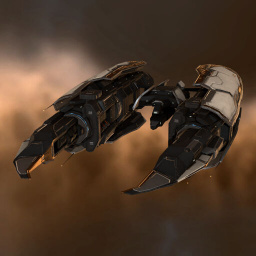 The Executioner was designed specially to counter the small, fast raider frigates of the Minmatar Republic; thus it is different from most Amarr ships in favoring speed over defenses. With the Executioner, the Amarrians have expanded their tactical capabilities on the battlefield. The Executioner is the Amarr Attack Frigate. The Executioner's extraordinary speed, agility, and bonus to propulsion jamming modules (warp disruptors, warp scramblers and stasis webifiers) make it a strong tackle frigate. The Executioner also has bonuses to energy turrets, which are useful when the Executioner is flown for solo PvP, but less useful in a tackler. The Executioner is a good hull for new pilots interested in learning basic tackling skills, and how to serve as a fleet scout (or "+1"). Flying the Executioner provides good practice for eventually flying fleet interceptors (such as the Malediction), which are more commonly used as fleet scouts and first tacklers. Nevertheless, even though the Tech I Executioner isn't quite as effective as a Tech II Interceptor, it can still serve as a strong long-point tackle ship. E-UNI Executioner pilots are advised to read the UniWiki guide to tackling, and to attend a Tackling 101 practical. Of the four racial Attack Frigates, the Executioner has the most armor HP, and the least shield. This makes it difficult to fit the tackle Executioner for tank, because armor modules and rigs carry penalties that counteract the ship's natural speed advantage. Tackle Executioners are more commonly fit for shield, which unfortunately does not provide as much benefit to this ship as it does to other Tech I tackle frigates. New Executioner pilots may need to train some shield skills in order to fly the ship in the tackle role. Other slots are typically filled with a warp disruptor ("point"), propulsion module (usually a microwarpdrive), modules that increase speed and agility, and shield modifiers. The Executioner's speed and thin tank make it best at the "first tackle" role, and so the ship is only rarely fit with a warp scrambler ("scram") or stasis webifier ("web"). The challenges of fitting the Executioner for fleet tackle, with its fewer mid slots and low shield HP, make the Executioner a bit worse than the other racial Attack Frigates at tackling, though it is still good. Omega characters who wish to fly fleet tackle may want to cross-train into the Atron or Slasher, or to quickly graduate into the Malediction Interceptor. On the other hand, the Executioner is better than other racial Attack Frigates at delivering and taking damage, especially when fit with an armor tank and energy turrets. PvE-fit Executioners are good at completing Level 1 missions (though maybe not as good as the Tormentor or Punisher, the Amarr Combat Frigates). The armor Executioner is also a good PvP ship, especially against enemy frigates and drones. Executioner pilots can often fill an "anti-tackle" role in fleets, eliminating enemy tackle frigates. In this way, flying the Executioner is good practice for the Imperial Navy Slicer, an Amarr faction frigate that is also suited to this role. Anti-tackle pilots need to have excellent Gunnery skills in order to make sure their lasers—which have the worst tracking of all turrets—can hit their small targets. Further information about additional or recommended skills to pilot Executioner for a specific or it's common role(s) can be written here. Priority for this fit is to land tackle. It is better to maintain safe distance while waiting for your fleet. The DPS of tackle fits is usually too low to apply any significant damage. Carry some Nanite Repair Paste to repair heat damage after overheating modules. The opportunity to dock up may not come often enough in hostile space. Target larger ships. The Executioner is especially effective against large ships, because they have trouble tracking the Executioner with their larger weapons systems. Try to tackle cruisers and up. Keep your distance. Check the optimal range of your fitted warp disruptor, and subtract 4 km from that number; this is the distance at which you’ll want to orbit your target. (This gives you 4 km of wiggle room.) If you stray too far below this distance, you will be within range of your opponent’s shorter-range scram, web and/or neuts. You can set your ship’s custom default orbit by right-clicking on the Orbit button in the Selected Item window; you should set your default 2 km less than the number you calculated above, because of overshoot at high speeds. Spiral in. Because the Executioner is poorly tanked, the Executioner pilot needs to avoid getting hit on approach. If the target is a turret ship, one way to avoid damage is to "spiral" towards the target, and to never fly directly at the target, in order to maximize transversal (and thus evade the tracking of the target's guns). The spiraling method does not help against opponents flying missile or drone ships, though, and Executioner pilots should just fly straight at these targets. Anticipate your opponent. Try and determine your opponent’s direction of flight, and cut them off. Your opponent may try to "slingshot" you by flying towards you, and making you overshoot the target. Be ready to change directions quickly. Call your point in comms. Let your fleetmates know when they should warp to you! Executioner pilots can learn more about tackling by attending Tackling 101. Piloting an Executioner in solo or small-gang PVP is challenging. Executioner pilots need to watch their capacitor closely, because lasers are cap-intensive, and it is all too easy to fire away capacitor that is needed to operate the ship's microwarpdrive and warp disruptor. Executioner pilots have to be familiar with their laser ammo (crystals), and know when to switch it based on target range. The pilot may also need to micromanage their trajectory, in order to match their transversal to their laser pulses. If the pilot can manage all of these things, the Executioner can theoretically apply the most damage out of all the Tech I Attack Frigates. This page was last modified on 2 November 2017, at 17:10. This page has been accessed 187,284 times.